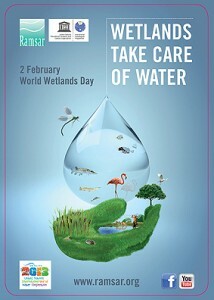 World Wetlands Day takes place on the 2nd February each year (see Editor’s Note 1). The theme for 2013 is that Wetlands Take Care of Water and this year the IPCC are encouraging Irish people to visit their local wetland to appreciate this fact. Bogs and fens for example store up to 98% their own weight in water. This water is released slowly during dry weather to replenish local supplies and is stored during wet weather to help prevent flooding in river catchments. The clean water protected in our bogs and fens is the source of life for most of the mosses that live there and that are responsible for creating bogs in the first place. Tourists marvel at the fact that it takes 3 years for their bog walking footprint to disappear from the soft moss surface. This year for world wetlands day why not go out and explore your local wetland. Choose a site from our top 20 bogs to visit in Ireland (see Editor’s note 2). The Bog of Allen Nature Centre in lullymore, Co. Kildare is open for you to visit and learn about the watery wonders of bogs and fens in Ireland, which are just a small part of the wealth of wetlands world wide protected under the Ramsar Convention. If you would like to visit IPCC, we are open Monday to Friday 10am to 4pm, see www.ipcc.ie. We are also happy to help you find a lovely wetland to explore if you would like to email us at bogs@ipcc.ie. Editor’s Note 1: On the 2nd February 1971 an international agreement was signed concerning wetlands of international importance around the world. As the event took place in Ramsar in Iran the agreement was known as the Ramsar Convention. This entry was posted in News and tagged Activities, Attraction, Bogs, experience, Ireland, Places to Go, Things to Do, Visitors. Bookmark the permalink.